WASHINGTON (Feb. 26, 2013) -- This week, U.S. service members around the world, along with their spouses and kids, are being been challenged to take a pledge to save money in their home budgets; to "set a goal, make a plan, and save automatically." As part of "Military Saves Week 2013," which began Feb. 25 and runs through March 2, service members and their families can point their web browser to militarysaves.org to take the pledge, said Barbara Thompson, director of the Office of Family Policy, Children and Youth, at the Office of the Deputy Assistant Secretary of Defense for Military Community and Family Policy. This week, U.S. service members around the world -- along with their spouses and kids too -- have been challenged to take a pledge to save money in their at-home budgets; to "Set a goal, make a plan, and save automatically." Thompson said this is the seventh year of Military Saves Week, which is cosponsored by the Consumer Federation of America. The week focuses on helping military families learn to save money, and to ensure they have the tools needed to reduce their debt and save for the future. Thompson said some of those tools available to military families include the certified financial managers at military family centers, for instance, that provide education and budgeting and counseling to service members and their families. Military banks and credit unions on installations, she said, are also required to provide those educational tools to service members and families. Additionally, the "Military One Source" program, accessible 24/7 online or via telephone, allows service members to get referrals for up to 12 sessions of financial counseling. Sgt. Maj. Bryan B. Battaglia, the senior enlisted adviser to the chairman of the Joint Chiefs of Staff, and his wife Lisa Battaglia, answered questions Feb. 26, during a bloggers roundtable about their own efforts to be financially responsible, the challenges faced by service members, and the importance of military leadership in helping young troops make the right financial choices. Mrs. Battaglia said that she and her husband are like every other military family. They've moved more than 16 times in 27 years, she said, and they've faced family emergencies and shaped their lifestyle to be based on one income. "As part of building a family, we, like others, sat down as a team and drew up a budget, adjusted it over the years, and saved where we could," she said. Early on, Mrs. Battaglia said, her family socked their money away in U.S. savings bonds as a way to guarantee a bright future. "We saved for many years and built a nest egg," she said. Today, the "Thrift Savings Plan" is available to service members, and both Sgt. Maj. Battaglia and his wife agree it's a good decision. As additional cost-saving measures at home, Mrs. Battaglia told reporters she's been making lunch for her husband every day for longer than she can remember. "Call me old-fashioned," she said. "Not only does it promote nutritional fitness, but the money that we saved over the course of time is huge." She also said that Sgt. Maj. Battaglia cuts his own hair, saving as much as seven dollars each week. "You add it up -- 52 weeks at seven or eight dollars a week, plus tips," she said. "These are just a couple ways that we still save to this day." Mrs. Battaglia said that her advice to service members it to live within their means, and, if possible, to have one person in the family manage finances. She said that their family can afford more expensive things now -- but they have built financial discipline into their household, and now the money they still choose to save in small places can be used in other places for more important things. "Financial fitness should be in every household," she said. Sgt. Maj. Battaglia said that as a young military family, it is temptation to live beyond one's means -- "there's temptation with impulse buying," he said. But the financial instability that comes with succumbing to temptation and irresponsible spending can have implications beyond the bank account. "Financial instability brings tension within a relationship and a marriage," Sgt. Maj. Battaglia said. "Financial fitness plays a big role in more than just being healthy in the wallet. We would like to teach a behavior within society, which once was, it's okay for young military couples to have second-hand furniture. What worked for us ... the cinder block with the piece of wood or the electrical spool that got sanded down and varnished as a coffee table really worked just fine as furniture for a young family like we, just starting out. It didn't have to be brand new, or Ethan Allen style that really set us back." The sergeant major also touched on a dangerous pitfall for young troops that are short on cash and need a quick fix -- the payday lenders, loan sharks and "questionable sales people that are ready to latch on to service members and families as soon as they enter into the military." Battaglia hammered multiple times that services must educate their troops to not be tempted by payday lenders and others "who are out to make a profit at any expense, and especially at a service member's expense." 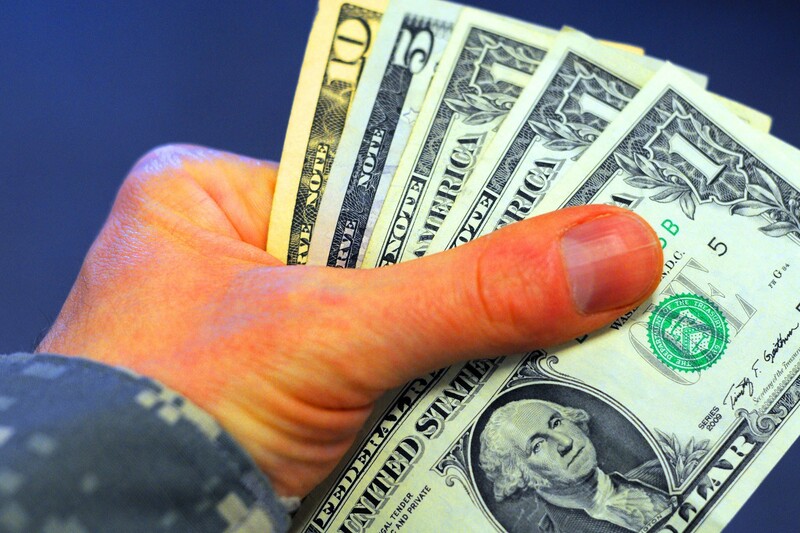 As an example, Battaglia said that in his youth -- at a time when there was no direct deposit of military pay, but instead service members were paid in cash -- if a service member ran out of funds, they might be tempted to go to a payday lender. "There were sharks out in the local community who would loan you $150, let's say, hypothetically speaking -- and the following payday when you got paid you had to pay them $250 back," he said. "So those loan sharks were hungry and active back then, and my senior [noncommissioned officers] kind of steered me away from those folks." To protect service members from those threats, Battaglia said that it's important that military leadership provide counseling to their subordinates and in some cases, be involved or be available in the decisions junior service members make that could dramatically affect their financial standing. "When a young trooper is preparing to buy a first car, I think a leader must be involved," he said. "Even when a young trooper is preparing to have a child for the first time, I think a leader must be engaged, and when a young trooper is preparing for marriage, a leader just has to be there. Each one of those real-world instances are investments, and major expenses -- and if they are not done correctly they could be catastrophic." Thompson said that finical education needs to start young, and military children are reaping the benefit of that philosophy. "We feel it's important to start with our military children," she said. "So many of them enter the military or are considering entering the military. So part of Military Saves includes our youth centers and our school-age programs. And I'm of a personal belief that we start with our preschoolers on basic money management." Starting young on responsible money management education is important, she said, because many of those coming into the service, she said, are coming in already in debt. She said that her office is working to develop a program for those who have been recruited into the military, but who have not yet started basic training, to help them deal with financial issues before they actually put their uniform on for the first time. Thompson said a website, moneyasyougrow.org, is useful in communicating to children of varying ages, in language understandable to them, the importance of how to use and manage money. Service members interested in participating in the Military Saves program can visit the program web site at www.militarysaves.org.